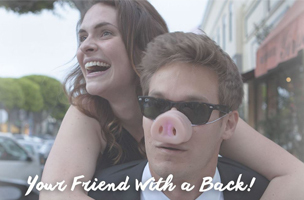 Ridesharing apps can create some extremely personal interactions -- nearly as personal as getting a piggyback ride from a random stranger on the Internet. Ridesharing is its own new market economy thanks to Uber, Lyft and many other startups. It’s a rewarding way to engage and exchange services with strangers, but it can also create intense personal interactions. That’s why this video from Piggyback resonates so well. We shouldn’t have to say this, but this is a parody app — it’s not real, but the laughs are. For those who have used Lyft as a service, you’re familiar with the rideshare pink moustache that adorns private cars. The drivers are also unusually friendly — often offering jokes and great conversations. Then there’s Uber, where you’re likely to get a bottle of water upon starting your journey. It’s strange performance theater, literally: on one trip, my Lyft driver put on a music album of him singing. My guy’s name was Danny. He was super profesh and halfway through I realized “Hey, he’s kinda cute.” I basically wanted to jump his bones right then and there but he insisted it was against policy to have relations with riders. Only after I threatened to give him a one snout rating did he passionately make love to me in the bushes. Currently, I’m pregnant with his or someone else’s child. I’ll know once I see the race of the baby. I really like how intuitive the app’s interface is and no physical money ever has to be exchanged! I’m kind of a sneaker head. Sometimes I hear about someone getting trampled to death for a pair of Jordans and I get it. Nothing is worse than a fresh pair of sneaks getting dirty. That’s why I’ve always envied paralyzed people. With Piggyback my feet never have to touch the ground and my spine can still send signals to the rest of my body.